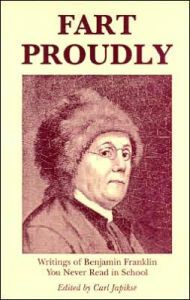 Fart Proudly is a collection of writings by Ben Franklin available on Barnes & Noble and contains many of his lesser-known and more-humorous writings. Yes, that is the name of this book! Independence Day is the time of year where we seem to get a very good survey of America’s founding, but what’s often lost on us is some of the more amusing anecdotes of American history. This week’s trek off the path takes us to one of America’s Founders, and a matter which is as timeless and egalitarian as its originator is. The person is Ben Franklin and the subject is flatulence.